Economics professor Mark Witte moderates a discussion led by University President Morton Schapiro and professor Gary Saul Morson. Northwestern University President and Economics professor Morton Schapiro, along with Humanities professor Gary Saul Morson (appropriately dubbed “Morty & Morson”) discussed their forthcoming book, Cents and Sensibility, on Monday night. Over 70 people attended the event held in Harris 107, which was hosted by the NU Political Union and facilitated by economics professor Mark Witte. “One difference between this book and other books is that my other books I teach in class. But they don’t come from the class. 90 percent of the material in this came from the undergrads. We taught this course seven times, and it has evolved over time,” Schapiro said. Schapiro mentioned a survey in which 58 percent of economists said their field had nothing to learn from other fields. 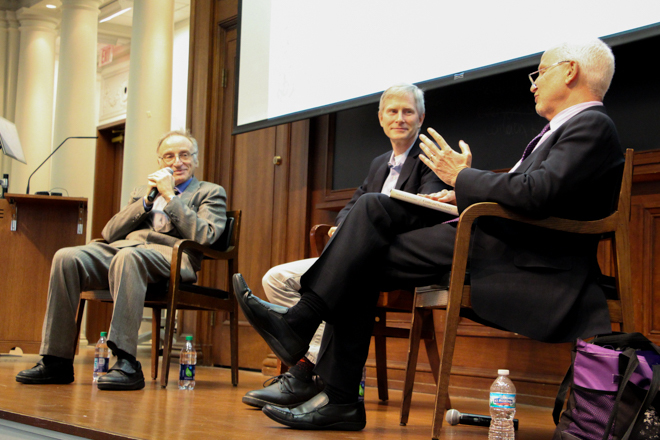 Both Schapiro and Morson took issue with how narrow economics seemed as reflected in the survey. “There is ample evidence that the field of economics is much too narrow. But the questions with which we engage are not narrow,” Schapiro said. “At some point, you need to be able to stand up and be able to see ‘how would this look like to someone not in this field?’ or ‘how does this sound to others?’” Morson said. He also emphasized that this is the point where literature and the humanities come in. When asked what the humanities can learn from economics, Morson replied with "respect for basic logic,” earning a few good laughs from the audience. Witte asked whether the message of this book will begin to affect universities and promote an interdisciplinary approach. Schapiro responded by highlighting the differences between liberal arts colleges and research universities, with the latter gathering mostly people with higher degrees of specialization. Weinberg sophomore Christie Sohn took the class with Schapiro and Morson before, and said she is glad the concept of the class is turned into a book. “The course is the exact definition of what it means to partake in interdisciplinary education,” Sohn said.